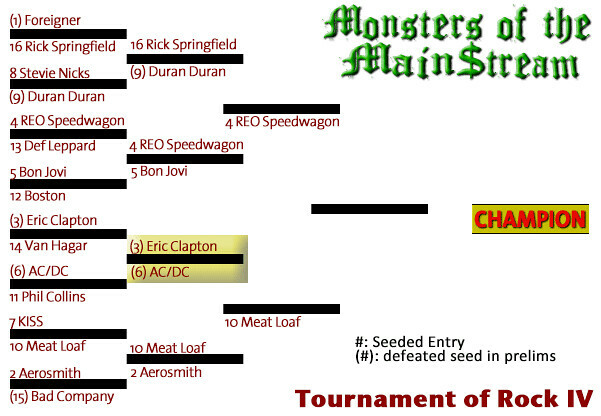 In our second quarter-final match up we had the makings of a blowout, as Aerosmith surged to a huge early lead. Then Meat Loaf’s fans weighed in, as it were, and the biggest solo artist in all of Hard Rock blew past the boys from Boston like, well, a bat out of hell, I guess, logging nearly 60% of the vote. Aerosmith, the tribe has spoken. We turn now to a couple of acts that have both made their livings slinging an axe, although in doing so they have proven that great tools can often be used in very different ways. And here’s AC/DC. They’re on the highway to meet the devil. Because the world moves a lot faster these days.